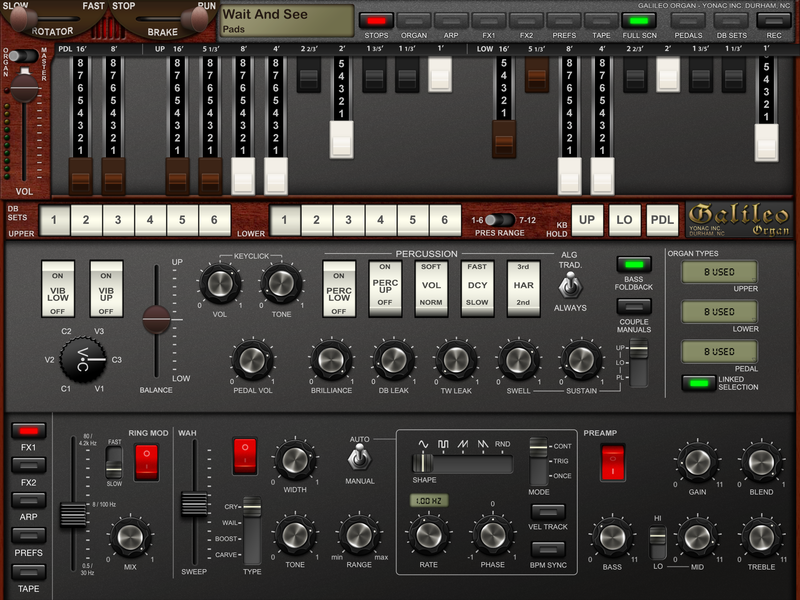 I often make use of a drum-machine when recording my song demos, even if the rhythm doesn’t end up on the final mix. There are quite a few excellent beatbox apps for iOS; my personal faves are Synthetic Bits’ FunkBox and DM1 by Fingerlab, and although I use both, I think FunkBox clinches the “drum-machine” slot in my top five. 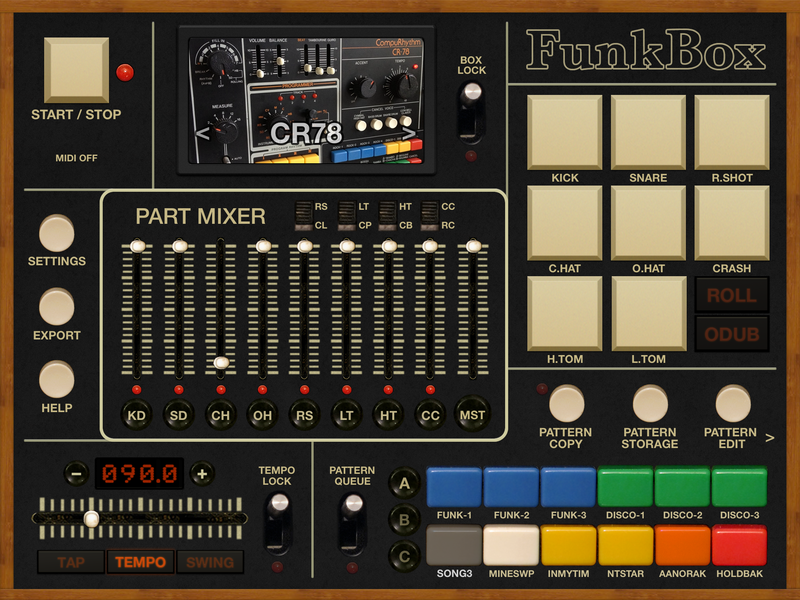 It sounds great (leaning on purpose towards vintage 70s and 80s machines), is easy to use and straightforward to control via MIDI, and I often set up a beat from FunkBox to chug away when laying down a first rhythm guitar part. Part of my interest in music-production apps for iDevices, is that the machines have become very capable for producing and recording on the move—i.e. wherever you happen to find yourself. Obviously, it’s not always feasible to lug one’s guitar collection around, and that arguably becomes even more acute when it comes to bass guitars (unless you own an Ashbory or Kala U-Bass, perhaps). I’m also not too comfortable with playing bass from a keyboard, so I wondered about a portable alternative. There are times when I might want to play bass on a demo, but I may not have access to my bass guitar (e.g. away from home), or might just feel like a different sound. I went looking for an app which could mimic at least electric bass—and any other bass sounds would be a bonus—and thanks to the iPad Musician Facebook group, was introduced to iFretless Bass. 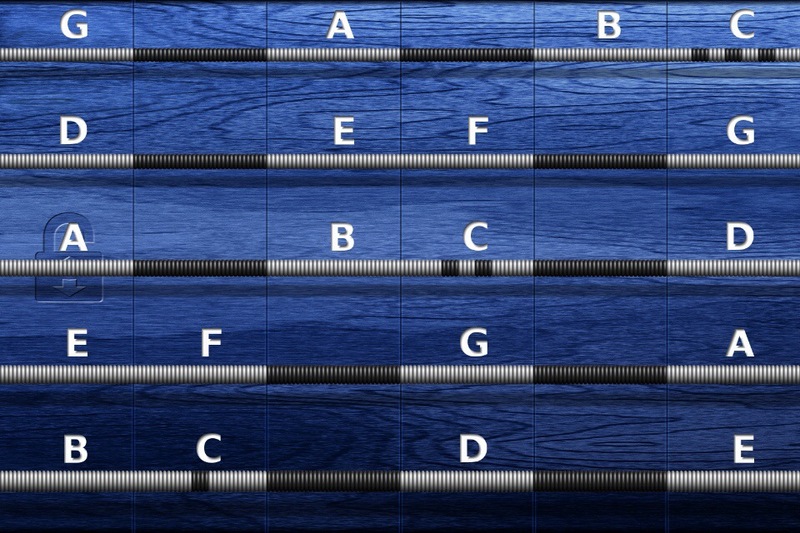 I’m putting together a dedicated review to this app, as it has become a must-have for my demo-recording, but in short: iFretless Bass gives you nine sampled basses (electric, upright and synthesiser) which can be played via “strings” on the iDevice touchscreen (it works surprisingly well on iPhone) or via external MIDI controller. I sometimes play bass-parts on iFB on guitar, via my Sonuus i2M USB guitar-MIDI converter—with the right settings and playing-style, it works very well this way. The touchscreen interface is intuitive, particularly for guitarists, and iFB can also act as a MIDI controller itself, to play other synth apps (Animoog‘s “BiggerBass” patch is a favourite of mine in that case). It’s not the cheapest music app out there, but iFB sounds great, records well (tip: try it through an amp-simulator like BIAS) and if you can’t get to a bass guitar, it’ll do a decent-enough job. I rather like “vintage” synths (especially analogue classics like Moog and ARP machines), but there was only one spare “slot” in this list for a synth app, and I could have chosen from quite a few candidates (see the end of the article for the “bubbling-under” apps!). In the end, I had to go with iMini. 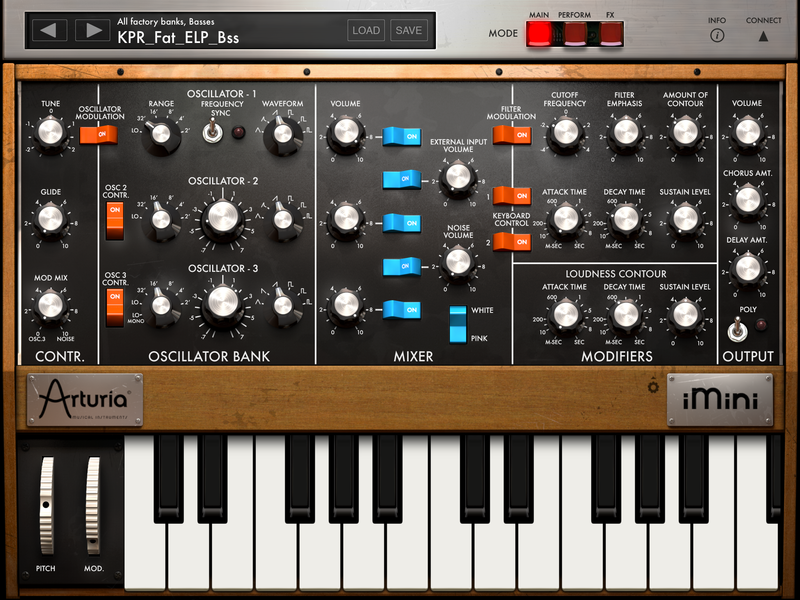 A joint production between Arturia and Retronyms, iMini is basically an iPad port of Arturia’s MiniV—a software recreation of the classic Minimoog synth, with various modern updates like polyphony and an arpeggiator. I don’t own a Minimoog, but from what I’ve heard, iMini does a very commendable impersonation, whilst running on an iPad and costing a tiny fraction of the sum a real Minimoog would set you back nowadays. I admit it: I’m a “sucker” for the Mellotron—that wheezy, Heath Robinson-esque proto-sampler with the banks of ancient tapes, which has graced many a prog-rock album (and plenty of non-prog ones!) since the Sixties. There are a few ways to get the ‘Tron Effect on an iDevice, but for various reasons, my fave is Super Manetron. 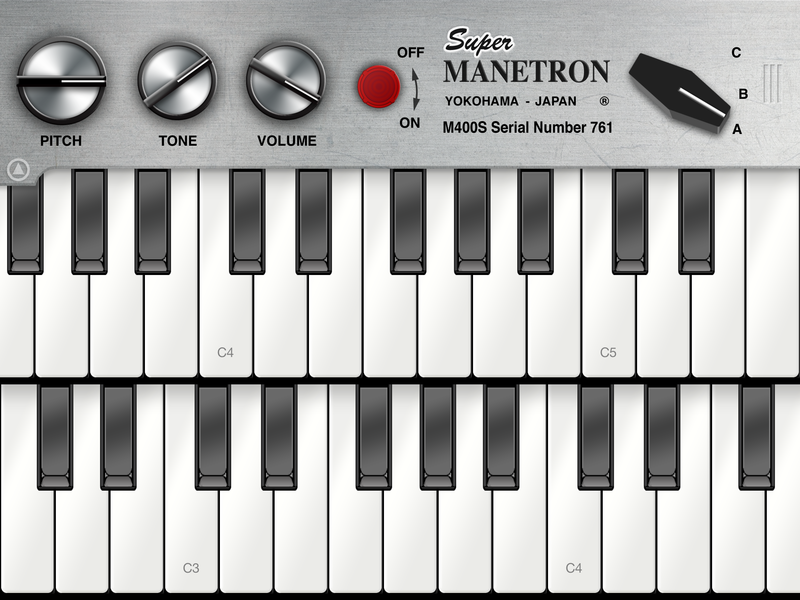 The interface is suitably simple (it’s basically a ‘Tron’s front-panel on the screen), and the sounds—reputedly sampled painstakingly from a real Mellotron’s tapes—have got the ‘Tron-tone to the proverbial T.
If there’s a downside: Super Manetron doesn’t seem to receive many updates, which is currently a problem, because as of November 2014 the app has yet to be updated for iOS8 (and specifically, with the latest Audiobus SDK). In plain English: if you upgrade your iDevice to iOS8, you lose Audiobus capability in Super Manetron. It’s a sign of how much I like this app, that I’ve been willing to hold off upgrading to 8 because I record quite a bit with SM. I hope this app gets the upgrades it needs, because to my ears, no other solution for iOS quite gets That Mellotron Sound. So far, the iOS8 upgrade has only given me the two problems I knew I'd get: iMini and Super Manetron support for @AudiobusApp is borked. @tawalker @AudiobusApp Hi, I'm preparing for upgrade for AB and wil support IAA. Stay tuned! As of late 2014, there are music-production apps available on the iOS platform, which can rival plugins on (say) Mac OS X costing many times more. In my book, Yonac Software’s Galileo definitely qualifies. On the face of it, Galileo is an outstanding tonewheel-organ (e.g. Hammond) emulator, with drawbars for tone-shaping and a wide range of effects—the latter including reverb, delay, a wonderfully-grungy pre-amp section… and joy of joys: a very realistic Leslie-cabinet effect. Bismark bs-16i: cryptically-named, but a very handy app to own, as it’s a full-featured, multi-timbral MIDI instrument app which uses SoundFont sample banks as sound-sources. I have plenty of SoundFonts from my computer-music-making in the 1990s and 2000s (and still used them in EXS24 in Logic Pro on our Mac), and I even built a couple many years ago, which I still use! I actually mentioned Bismark bs-16i in a blog post of mine about SoundFonts from 2013, and the app is under active development, so it continues to improve. This one really was a “narrowly-missed” in the above list, and only because the final five are exceptional apps. Animoog: a very powerful synth from the company which did so much to bring synthesis to musicians, and continues the work of its founder. Animoog missed out on the top-five, largely because it’s pretty pricey as iOS apps go (though I got a very good deal on it), but also because many of the presets aren’t really to my taste (and I haven’t had time to learn how to program Animoog patches). So… why is it here? One word: “BiggerBass”… probably my favourite synth-bass patch ever. A glorious festival of low-frequencies, with a growling gnarliness when you reach for the modulation or play the notes harder. 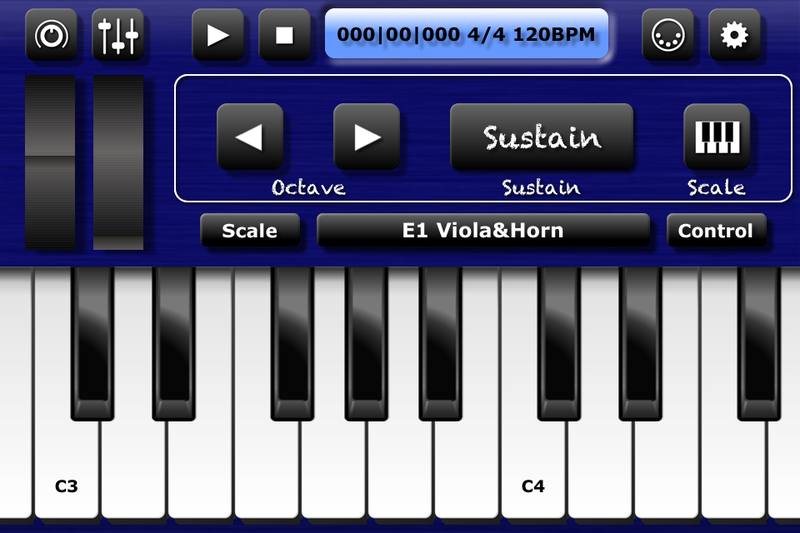 Surprisingly useful for songs, though, and great when played via iFretless Bass’ touchscreen interface.